Melt-in-your-mouth goodness. That’s what chocolate is. If you crave this sweet indulgence, you’ll satisfy just about every desire at any one of these chocolate-centric shops. From rich caramel delights to decadent toffee, these 10 chocolate shops in New Mexico will keep you coming back for more! Indulge in a mouthwatering selection of European style chocolates, made with exceptional ingredients. Choose from rich caramel and pecan turtles, English toffee, homemade caramels and truffles in dark or milk chocolate, flavored with liqueur. No preservatives, additives or artificial ingredients used in any of these sweet treats. It’s all about the chocolate! Which comes from the Guittard Chocolate company in San Francisco known for its American manufactured Old Dutch milk chocolate, semi-sweet dark chocolate and white pastel ribbons. All sweets are made fresh daily with hand-crafted care at this down-to-earth shop. Nut clusters, handmade truffles, hand-mixed and hand-formed fudge, barks and brittles and toffee make choosing just one piece impossible … so get a box and take some home. Follow the aroma of fresh chocolate and you’ll discover this sweet shop not far from the historic downtown plaza. Treats are made with gourmet dark chocolate created onsite using a bittersweet blend of dark chocolate and fresh, local and organic ingredients, making for an over-the-top chocolate experience. An added bonus—customers can watch as these artisanal sweets are hand-dipped in a flowing river of chocolate. Eclectic, exotic and exceptional, both in ambiance and confections is what you’ll find at this tiny shop, a stop on the Turquoise Trail. Step inside and be treated to chocolate eye candy unlike you’ve ever seen. Enticing rolled and dipped truffles, white and chocolate bark with nuts, salts and fruits are always made with fair trade chocolate and organic ingredients, if possible. 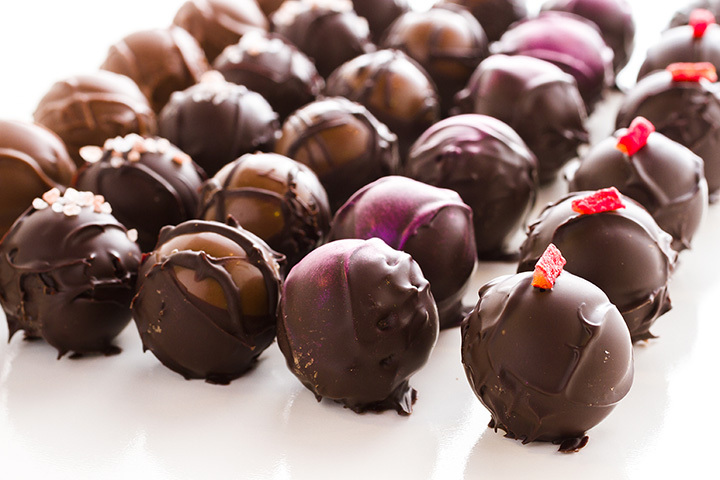 You’ll palate will be changed forever after eating chocolates with flavors like red chile mango, Thai lemongrass and pink peppercorns paired with lavender. The chocolates found here are a delightful blend of the traditional and the contemporary. With more than 300 chocolate candies and other sweet products, you’re sure to find something you like. Clusters, caramels, creams, meltaways, truffles and molded chocolates share space with candy apples, fudge and specialty cocoas. Customers are treated to seeing how everything is made—in copper kettles on gas-fired stoves and marble slab cooling tables. If you’re looking for an explosion of flavor in a chocolate confection, stop by this chocolate laboratory where cayenne, jalapeño, sea salt, cacao nibs and fruit flavors are melded together with rich organic ethically-sourced cacao beans from around the world. The lab is in full view. Chocolatiers roast, crack and winnow beans. They hand-dip bonbons and barks and create amazing chocolate elixirs. The small-batch, hand-crafted chocolates taste so good, you might just forget that a little bit of high-quality chocolate is good for you! The highlight here is the Candy Mountain Fudge. Choose from a selection of more than 40 varieties. Favorites include green chile pistachio, Amaretto chocolate swirl, peanut butter supreme and a hot or mild red chile chocolate pecan. If you’re feeling nostalgic, pick up a Black Cow, Charleston Chew or a Mallo Cup for a taste of another era. The hand-crafted candies made fresh daily here are the brainchild of the owner, which began by chance in her kitchen. It’s now a popular spot in downtown. The small-batch selections make it easy to be adventurous. Everything is made on-site in an open kitchen that lets customers see the chocolate magic unfold in real time. Truffles, toffees, barks are made with both dark and milk chocolate, the finest cocoa, organic cream and butter and all-natural flavors. This family-owned shop has been selling handcrafted chocolates since the 1950s. Their motto, “Our candy is made to eat, not to keep,” gives you permission to do just that. The piñon candies are made with locally-grown nuts. Get them rolled in caramel, in pralines, horny toads, toffee, creams, caramels and clusters. Other treats include peanut butter and molasses chips, nougats and chocolate covered pecans, walnuts, almonds and cashews. So many choices here, it’s hard to decide which of the many flavors of fudge to try. So, ask for a taste before buying. Free, small samples are readily offered. The fudge is rich and creamy. Popular flavors include praline, snowy rocky road and chocolate walnut, although there are new combinations weekly. Don’t miss the hand-squeezed lemonade, either.